Susanna has been in a cordial making mood lately. She spoke on this topic at the PA Herb Festival and will do so again at the Baltimore Herb Festival the last Saturday in May. We also have a fun Liqueur making class scheduled here at The Rosemary House in August which features lots and lots of taste tasting! I also gently press out the berries using this old lemon juicer I picked up at a yard sale. I say gently press because you want only the sweet. It is also best if you simmer only berries and no stems (the stems are bitter). Then you add that syrup to 27 oz of alcohol. Your favorite is fine. This time I used rum. YUM! As with all liqueurs they improve with age -- Letting them sit 3-4 months is what we find to be the hardest part of the whole process. It will maintain this lovely deep purple color. Once it has aged: use as a dressing on a salad, or mix with a lemon/lime soda as a refreshing beverage, or drizzle over ice cream. It would also be good in a trifle. I recently read a short article about Creme Yvette, a 100 year old Violet liqueur that ceased production in the 1960's. I read the article a week or two ago when the lawns were brimming with violets. So I was inspired to make my own Violet Cordial. I began with this jar of violets and I poured vodka over the violets. I let them soak for two weeks in the vodka but was very disappointed in the result. So I went back to the violet lawn and gathered twice this amount of the remaining violets. Those I simmered in 1 C water and 1/2c sugar. This yielded a very floral tasting sugar water. But surprisingly it did not have a pretty purple color that I expected. Pleased with the results of the Violet sugar syrup. I combined the violet vodka and the violet sugar syrup together and have a floral liqueur, which I bottled in a pretty blue jar to compensate for the lack of color. (I am not too disappointed in the lack of color as I know the colors achieved from flowers often fade quickly anyway.) It has been aging for all of two days and the flavors are blending and mellowing together. I am sure next month it will be perfect. Never having tried Creme Yvette I don't know if I am close to the original recipe or not. I think I am probably off the mark a bit as I have read it has some Vanilla, berries and other spices in it also. Several years ago, I had the opportunity to travel to London with a very special group of women. The first stop for Afternoon Tea was at the Tea Palace in Notting Hill. At the time, it was considered the newest, chic, star studded spot to take tea. The tea tray was beautiful, the the tea selection impressive. The purple T on the plates made a subtle statement. We also enjoyed a Champagne Tea at The Ritz. Elegance. Sheer elegance. Gold, glamour, glitz. The Ritz. Even the bathroom warranted photographs. Here, the tea tray, note the champagne glass, and the silver milk pitcher and tea strainer too! 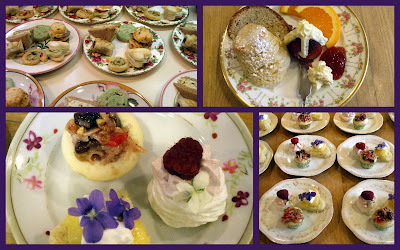 Check out this gorgeous selection of desserts on the top tier. Fabulous! Afternoon Tea at the Lanesborough Hotel, yummy. Excellent variety of sandwiches on the bottom tier, tiny tea breads in the middle, desserts on the top. Once we devoured all of that, a separate plate of scones and toasted tea cakes was brought out to the table with clotted cream, lemon curd and strawberry jam. Delicate piano music accompanied this delightful tea. This past Monday, the Mid-Atlantic Tea Business Association held their annual seminar at The Tea Trolley in Delta, PA. We had several informative seminars, including the tea and cheese pairing shared yesterday. Since this is a day long gathering, afternoon tea typically is included. Here, Rachel, the owner is presenting the lovely tea tray to our table. Rachel recently acquired a beautiful mansion, spent nine months renovating, and has happily opened her tea room. We enjoyed a delightful typical afternoon tea. A thick potato chowder was served first followed by this yummy tea tray full of delightful flavors. Our table enjoyed a variety of tea, selected from an extensive menu. Should you happen to be in Delta (near the PA/MD border), do try and schedule a visit to this beautiful tea room. Recently, I had the chance to enjoy a Tea and Cheese Pairing conducted by Mim Enck of the East Indies Tea Company. This beautiful arrangement of five tea tasting cups and five spoons with assorted cheeses silently announced the taste treat that was to follow. The first tea, a Lung Ching Dragonwell from China with a sweet note was paired with a mellow and soft Triple Creme cheese. Both the tea and cheese were delicate and complemented each other well. Genmaicha from Japan, a brown rice tea with a toasted and nutty flavor was paired with a homemade feta. This was a nice combination of flavors. Mim noted that Genmaicha is a very versatile tea, and she will often use it as a base for making miso soup, with soba noodles and tofu. Next was a good everyday tea from Africa, Kenya Milima with a delightful sweetness. It was paired with Irish Cheddar, also a light sweet cheese, differing from traditional American cheddar. When combined, the tea and the cheese produced a subtle apricot note. Nutcracker Sweet, a spicy hearty flavored black tea, was enjoyed with a NY State Smoked Gouda, a soft cheese, with hints of smoke. When the tea and cheese were paired, the smokiness of the cheese became enhanced. And finally, an Assam Halmari was enjoyed with a Date & Orange Stilton. The Assam has a sweetness to it which blended well with the almost fruitcake flavor of the Stilton. Absolutely fun and enjoyable! Our speaker Lady Lisa Lewis brought along her traveling museum of Victorian Clothing. She had a small sampling of many items including bloomers, drawers, corsets from child size to large size, many hats and more. 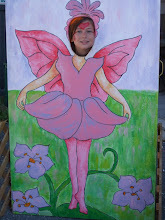 It was a fun display of all true Victorian/Edwardian clothing. No reproductions here. Do you know the first clothing item a Victorian lady put on? Her stockings and shoes because once the corset was on you could no longer bend over to button the shoes. The hats used so many feathers especially ostrich feathers that the National Audubon Society was started in 1920 in part to protect the birds from the milliners. It's all in the detail. Lady Lisa will be back again next spring with her collection of Victorian Bridal wear. Combine wine, juice, zest, and sugar in a bowl. Allow flavors to blend for 3 hours or more. Prior to serving, add heavy cream and whip vigorously until mixture thickens and begins to turn frothy. Serve and Enjoy. Considered one of England's great sweets, there are as many different spellings (sillabub, sillebub, syllabube) as there are variations to this basic syllabub recipe. The original version contained raw egg to help stabilize the heavy cream; however, the egg has been removed in slightly more modern recipes for safety concerns. A syllabub can also be made with the wine on the bottom and the thick frothy cream served over top. Yet another version, when prepared as a dessert, is much thicker, and served with a spoon. Syllabub is a perfect addition to your Afternoon Tea menu when it is a very special occasion. Do serve it forth in the most elegant glass available, lightly dusted with nutmeg if desired. 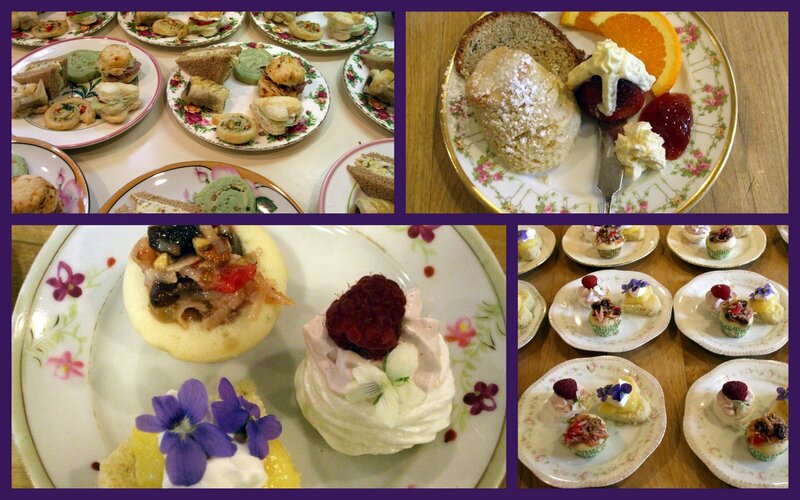 The special event featured in the tea room today is The Victorian Ladies Tea and Program. We will be celebrating the Victorian Era with an elegant Afternoon Tea and a presentation by Lady Lisa Lewis, a living history actress of the Victorian and Edwardian Era. One last peek at the Penn Cumberland Garden Club (PCGC) Flower show. 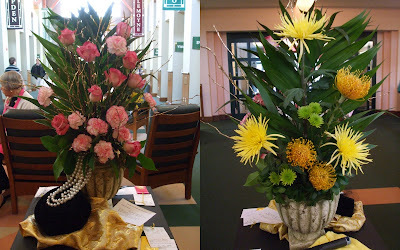 This design class was entitled "Then and Now" as the floral arrangements depict the past of PCGC and also the future of the club. This duo design (unique front and back arrangements) was staged on a 36-inch pedestal with a 20-inch square top. One design is meant to be viewed upon entering the library and the show, and the second design is meant to be viewed upon leaving the library. 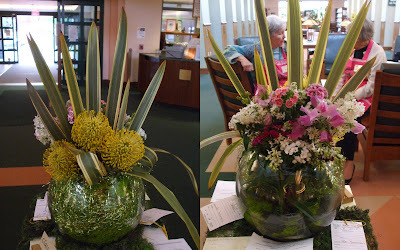 These side by side photos show the two unique floral arrangements that comprise the duo design. 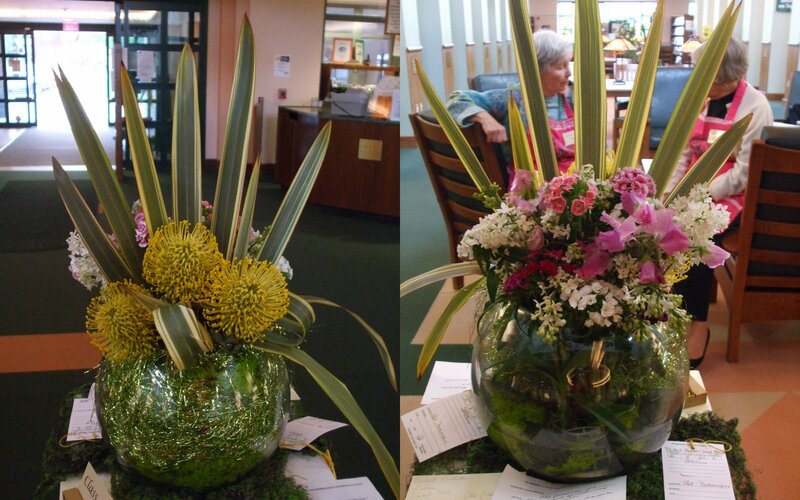 The 'now' designs were featured with gold flowers as the Garden Club is celebrating their 50th Anniversary. 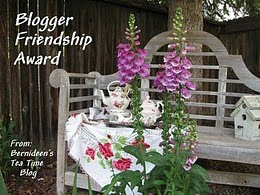 Bernideen has included Rosemary's Sampler among a list of blogs she enjoys reading and has presented us with this Friendship Award. Be sure to visit Bernideen's Tea Time Blog to discover an assortment of fun and clever bloggers, some you probably already know, others might be a new discovery. And be sure to poke around Bernideen's blog. She shares beautiful posts about tea, hospitality, food, and the gorgeous scenery of Colorado Springs, CO. It is my hope that a trip to CO is in my future as I would love to visit her shop! The members of Penn-Cumberland Garden Club had a workshop late last year to create terrariums to exhibit in the recent flower show. There was also a class for Cactus and Succulent Dish Gardens. Here is a selection of entries from both classes. These classes are featured in the horticulture section of the flower show. Additional entries in horticulture included many types of Daffodils, African Violets, Branches of Willow, Red bud, tulips and more. And the Blue Ribbon (First Place) terrarium. While these are considered horticulture there are points given for overall effect, which includes design elements. 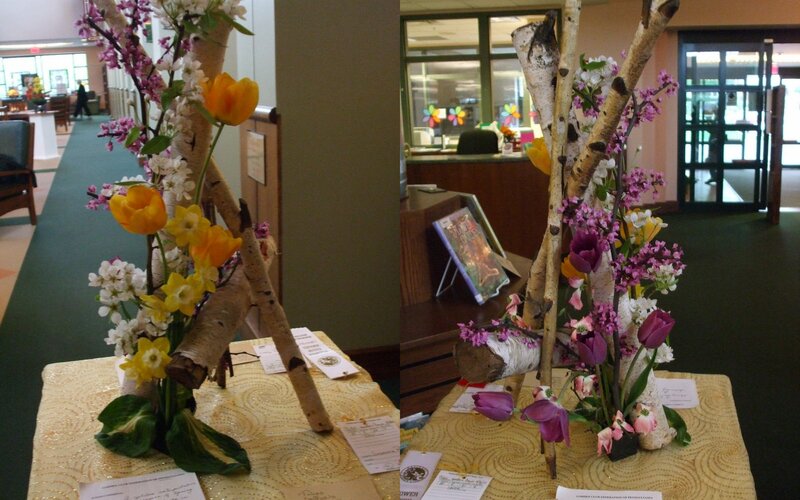 We're sharing the final grouping of tables from the Penn-Cumberland Garden Club Flower Show. This is an "exhibition table" which is an artistic arrangement of table components within an allotted space to provide a creative effect without consideration for functional placement. First place above shimmered in spring and gardening! Second place exhibited a great translation of the "Golden Anniversary" theme. Lovely flow is demonstrated in this third place entry. Penn-Cumberland is a very active federated garden club celebrating it's 50th Golden Anniversary year. The flower show followed the Handbook for Flower Shows produced by National Garden Club of which Penn-Cumberland Garden Club belongs. whilst yet is time" (Edmund Spenser). This collection of functional table tops was on display in the library during the Penn Cumberland Garden Club Flower Show this past weekend. This design class was a special tribute to Peggy Waters (1927 - 2008), an active club member, an award winning floral arranger, and winner of the Presidents' Perpetual Trophy Award 9 times. The Penn Cumberland Garden Club held a Spring Flower Show this past weekend at a local library. Located in the children's section were table designs that would be considered functional for a child's birthday party, set for four. This table, receiving an honorable mention, featured Alice in Wonderland as the theme. The third place winner set a very colorful table with Mrs. Potts as the centerpiece. Colorful Mary Englebreit fabric was featured on the second place table and carried out throughout the design. And bold primary colors graced the first place/blue ribbon winner. Any one of these parties would be an event I would like to attend! Easter Weekend provided us with some extra coffee grounds which we don't usually have. The weather was so beautiful that the coffee was enjoyed in the garden and the grounds will be enjoyed by the garden. Coffee (and tea too) act as a slow release fertilizer and are a fine amendment to the compost pile. We toss them in filter and all. We will mix coffee grinds in with the soil of our houseplants as coffee adds nitrogen. Plants that thrive in acidic soil such as azaleas, rhododendrons, hydrangeas, raspberries, and lily of the valley will benefit from the addition of coffee grounds to the soil. Many books indicate that coffee grounds help to repel slugs but we haven't found that to be true in our garden. Coffee grinds help feed the garden worms too...... but I haven't read any studies whether the caffeine helps them to aerate the soil faster.... perhaps!? Also, a very special thank you to BIL Phil for replacing the wooden slats and stabilizing the almost but not quite fifteen year old compost bin. It was beginning to show its age, but with his skillful handiwork, it is once again fully functional. such as this clump of garlic chives. Chives, mint, lemon balm, monarda, echinacea, violets, hostas, thyme, catnip, comfrey, and many other plants lend themselves nicely to root division.